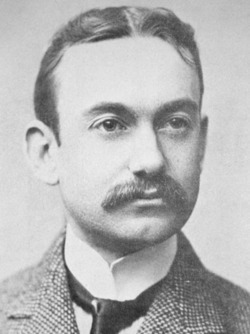 Horace Trumbauer was a prominent American architect of the Gilded Age, known for designing residential manors for the wealthy. Later in his career he also designed hotels, office buildings, and much of the campus of Duke University. Trumbauer's massive palaces flattered the egos of his "robber baron" clients, but were dismissed by his professional peers. His work made him a wealthy man, but his buildings rarely received positive critical recognition. Trumbauer was born in Philadelphia, the son of a salesman. He completed a 6-year apprenticeship with G. W. and W. D. Hewitt, and opened his own architectural office at age 21. He did some work for developers Wendell and Smith, designing homes for middle-class planned communities, including the Overbrook Farms development. Trumbauer's first major commission was Grey Towers Castle (1893), designed for the sugar magnate William Welsh Harrison. Its exterior was based on Alnwick Castle in Northumberland, England, although its interiors were French, ranging in style from Renaissance to Louis XV. Harrison introduced him to the streetcar and real estate developer Peter A. B. Widener, whose 110-room Georgian-revival palace, Lynnewood Hall (1897–1900), launched Trumbauer's successful career. For the Wideners, the Elkinses and their circle, he designed mansions in Philadelphia, New York, and Newport, RI, office buildings, hospitals, and the main library at Harvard University. In 1903, he married Sara Thomson Williams and became stepfather to Agnes Helena. Architectural Record published a survey of his work in 1904. In 1906, Trumbauer hired Julian Abele, the first African-American graduate of the University of Pennsylvania Architecture School, and promoted him to chief designer in 1909. Trumbauer's later buildings are sometimes attributed to Abele, but this is speculation. With the exception of the chapel at Duke University (1934), Abele never claimed credit for any of the firm's buildings designed during Trumbauer's lifetime. Philadelphia Museum of Art (1916–28). This was a collaboration between Trumbauer's firm and Zantzinger, Borie and Medary. The commission for the Philadelphia Museum of Art (1916–28) was shared between Trumbauer's firm and Zantzinger, Borie and Medary. Trumbauer architect Howell Lewis Shay is credited with the building's plan and massing, although the perspective drawings appear to be in Abele's hand. When it opened in 1928, the building was criticized as being vastly overscaled and nicknamed "the great Greek garage". But, perched on Fairmount Hill and terminating the axis of the Benjamin Franklin Parkway, it is now considered the most magnificently-sited museum in the United States. Despite tremendous success and his apparent ability to impress wealthy clients, Trumbauer suffered from overwhelming shyness and a sense of inferiority about his lack of formal education. He had a number of commissions until the Great Depression, but began to drink heavily to help bear his burdens. He died of cirrhosis of the liver in 1938, and is buried in West Laurel Hill Cemetery, Bala Cynwyd, Pennsylvania.